It’s been a non-negotiable for years that any product I use is cruelty-free (not tested on animals) and vegan (not containing any ingredients that comes from animals). While pregnant, though, I got in the habit of also using only the most clean products on my skin… definitely no toxins or potentially harmful chemicals… And now, I’m hooked. A few products in particular stood out to me as keepers and game changers. I swear… You’re going to wonder how you ever lived without them in your rotation! Coola’s Sunless Tan Anti-Aging Face Serum. Ok… I will use this stuff for the rest of my life!!! It’s amazing. Eco certified and made with organic antioxidants, it is great for giving your skin a streak-free glow while also making it look smooth, even, and more youthful. It is a fragrance-free formula, but I love the way it smells. I’ve been applying it at night before bed– sometimes alone and sometimes mixed into a moisturizer, depending on how intense I want my tan. Osea Malibu’s Hyaluronic Sea Serum. 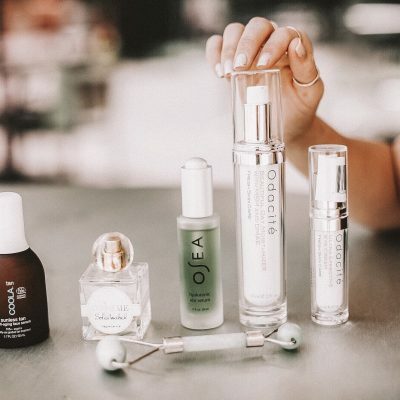 If you’ve followed me for awhile, you know I’m OBSESSED with Osea’s entire product line. It’s somewhat of an investment, but is truly so worth it if you are prioritizing your skin. This particular, all natural serum is award winning, and I can see why– it visibly smooths fine lines and makes your skin look so dewy and moisturized. A little bit goes a long way, so one bottle lasts forever. I put this on every morning before my moisturizer, and it evens my skin tone (especially the red bits around my nose) and gives my face a smooth, velvety finish- not greasy at all. LOVEEEE. Odacite’s Beautiful Day Moisturizer with MSM & DMAE. 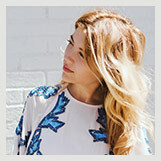 I’m always on the lookout for a good daytime moisturizer that won’t be too heavy on my skin. This one– containing organic ingredients like virgin coconut oil, aloe, jojoba oil, and tea extracts–is PERFECT. It makes my skin look perked up, firm, and moisturized. This line is new to me, having been introduced to it midway through my pregnancy by Petit Vour clean, vegan beauty box (I’m sure you’ve heard me talk about Petit Vour in the past… They only associate with the best products and ethical brands, so I always trust their recommendations). I love the Odacite story… Essentially, the founder became obsessed with removing toxins from her life and beauty routine after a breast cancer diagnosis. Word spread fast about the products she was making for herself and private clients, and voila, Odacite was born. (Check out the story here.) But I digress… Invest in this daily moisturizer if you’re in the market for one. It’s incredible. Odacite’s Ultra Effective Eye Cream. This won a performance award in Vogue mag! This product is pricey, but worth it. In the Odacite way, organic ingredients include blue green algae, vitamin e, and pomegranate extract. The Hyaluronic acid (approved safe to use topically while pregnant by my doc) draws in major moisture. Your under eye area immediately looks plumped and smooth. I put this on every morning and night, using less than half a pump, so one container will last forevaaa.